August is that kind of month to recharge the creative batteries, and build up stock of merchandise for our schedule in September so we left lots of air in the schedule. In the back of our calander i had written down one of the invitations we gathered in April when we participated in Vermillion in Bloom Garden Show… and it was for a saturday farmers market that impromptu sets up in Victory Park, located at Ohio and Main in the Old Harbortown section of Vermillion. A quick email and phone call and we were in. 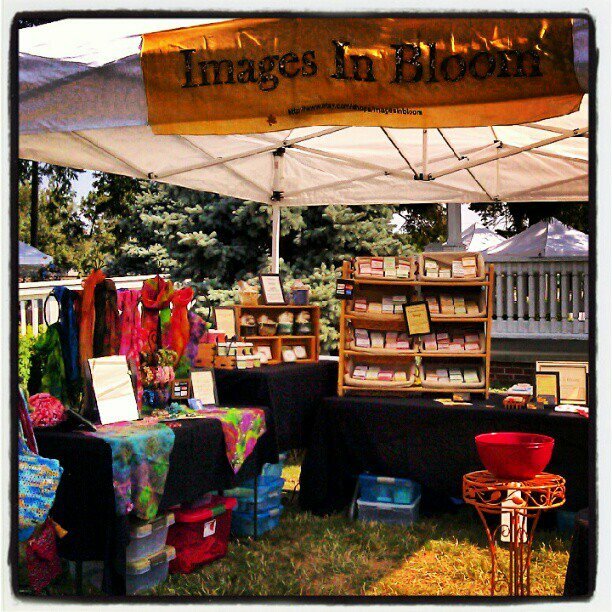 Last saturday we headed to vermillion packed with our arsenal of soap and all of our great stuff. What a great market. Several farms brought their bounty… fresh blueberries, grain fed beef, lucious salad fixings… including unique herloom tomatoes, raw honey, and so much more. We were honored to be a part of the day. What do i love about smaller towns? That sense of everyone knows your name, and everyone knows what is going on. Like Burton, Vermillion offers that quaint charm, and sophistication that makes it a warm and friendly place. What i also love was a visit by a woman who bought soap from us in April, and subsequently ordered more soap which we shipped to her in May. She looked for us. It was so nice to see her. Well, here is your invitation – Visit the Vermillion Farm Market on saturday from 10a to 2p – say hi to us if you are there. And plan to bring home some good eats, and maybe a few extras!! !